Viknesh Vijayenthiran October 26, 2018 Comment Now! 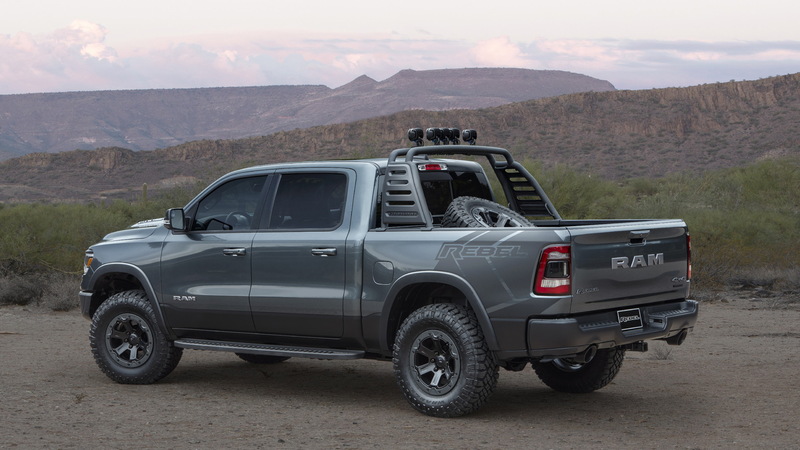 This year's SEMA show is just around the corner and Ram has previewed two Moparized concept trucks it plans to unveil. Both are based on the redesigned 2019 1500, and as is typically the case the concepts probably preview a host of upgrades coming to the Mopar catalog in the not too distant future. One of the concepts is based on the 1500 Rebel and comes with numerous parts to reinforce the truck's off-road capability. 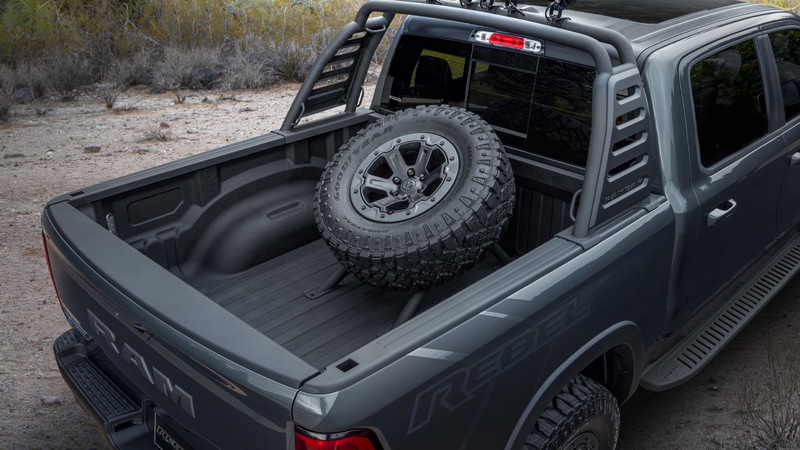 The list includes a 2.0-inch lift kit, 18-inch beadlock wheels, 35-inch Goodyear DuraTrac tires, aluminum running boards, sports bar and lights, and gray metallic skid plates. Under the custom performance hood is the familiar 5.7-liter V-8 which has been enhanced with a cold-air intake. Inside, soft and hard interior trim have been transformed to carry a black monochromatic look, a distinct change from the standard red anodized Rebel trim. 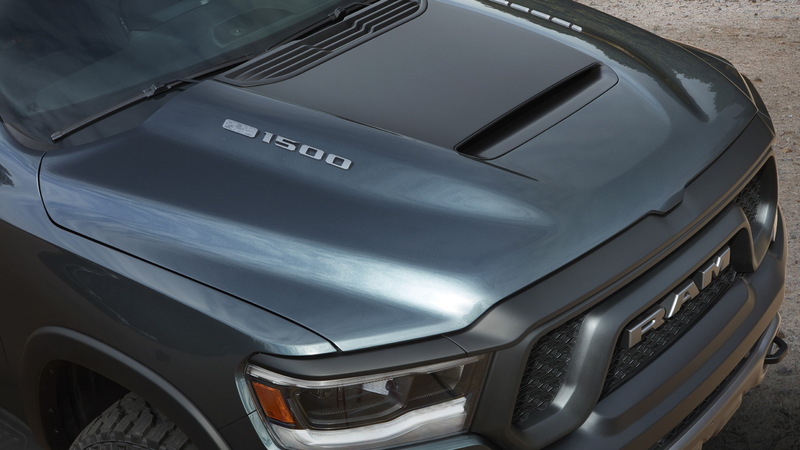 Mopar accessories complete the interior, including all-weather mats, brushed and polished door sill guards with the Ram logo, wireless charging, and a custom pedal kit. 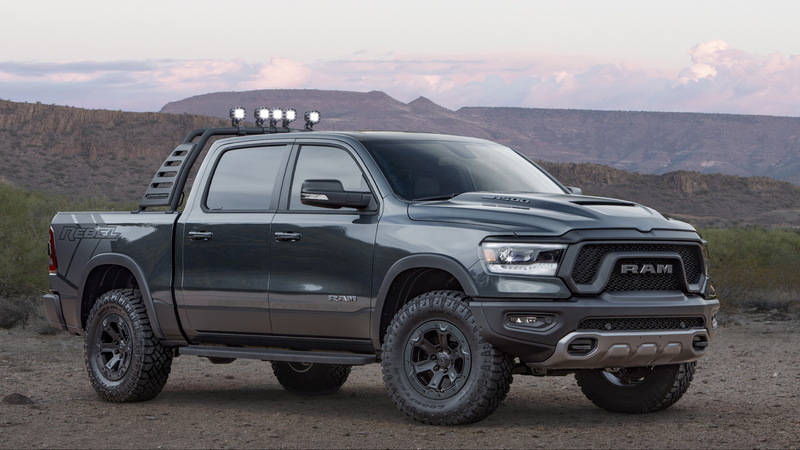 The second concept builds off the 1500 Big Horn trim level and features a prototype lowering kit that drops the truck 2.0 inches, providing a more aggressive stance and appearance. It also sports 22-inch wheels housed within flared wheel arches. Heading inside, Mopar accessories include all-weather mats, brushed and polished door sill guards with the Ram logo, and a custom pedal kit. Here, too, you'll find a 5.7-liter V-8 with a cold-air intake. 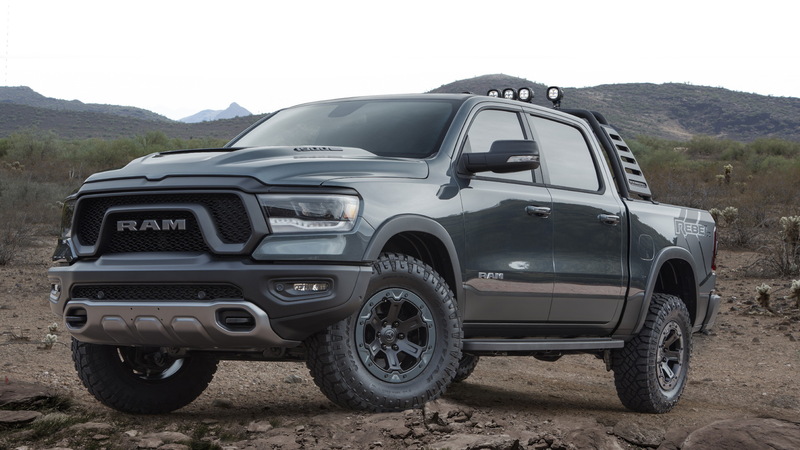 The pickup we're really waiting for from Ram is the production Ram Rebel TRX, which Fiat Chrysler Automobiles' truck division announced in June. All Ram will say about it is that the launch will happen before 2022. Mopar says it will have 14 vehicles on display at SEMA, as well as hundreds of parts. One of these will be a new crate engine expected to be a modern version of the 426 Hemi V-8 nicknamed the elephant engine. The action kicks off in Las Vegas on October 30, and for our complete SEMA coverage simply head over to our dedicated hub.